Have you ever opened an email newsletter and had to scroll to the right to see the whole thing? Or maybe the print was so small you could barely read it. Unless you are careful about the formatting of your email newsletter, you could be unknowingly losing subscribers. That’s because you didn’t make your email newsletter mobile device friendly. What does your email newsletter really look like on mobile devices? Most often, a person with mobile device can access the same email inbox from both his phone and computer. This accessibility poses a challenge to you because some emails are easier to view for a person using a computer than using a mobile device, and vice versa. For example, sending an e-newsletter with three columns of text could look great on a big screen, but it’s really hard to read on a 4-inch mobile screen. Similarly, sending an e-newsletter that contains a link to purchase a product might get an immediate response when recipients are in front of a computer, but causes frustration for those who discover that they can’t make the purchase via their cell phones because the technical capabilities of the mobile device or the online store are limited. Your customers sign-up for your e-newsletter because they’re interested in how you can help them. You’ve earned their trust. Now it’s your job to not abuse it. If your email is difficult to read or view on your customer’s mobile device, they’re likely to send it straight to trash. Your customers are too busy to have to make manual adjustments just so they can read your email. The number of people using smartphones to check email is increasing every year. Be sure your e-newsletter is easy for them to read by keeping the design simple. The easiest way to do this is to use an e-newsletter template. Here is a simple design that is easy to read on any computer or mobile device. 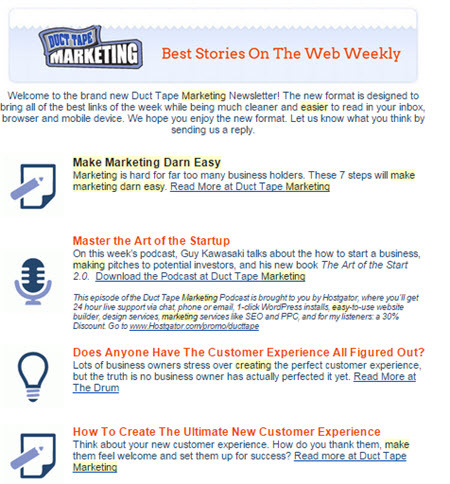 This is the recently re-designed Duct Tape Marketing newsletter. Consider investing in a responsive design; a practice of building e-newsletters optimized for screens of many sizes: smaller smartphones, tablet screens, laptops and large desktop monitors. It uses code that automatically detects the screen size and the capabilities of a mobile device. A single-column layout looks great, and is much easier to read than a two or three column layout. Your email should be no wider than 600 pixels; otherwise you may run into that problem of having to manually scroll to the right. Use large enough fonts. 16 points is ideal for ease of reading and ease of clicking through on links. 13 points is the smallest size you should use in your emails. Tap target size should be 44 wide, 44 tall, and 8 between clickable elements. Be sure to use alt text (alternative text) for all images so readers who do not allow pictures will be able to read the description of the image. Use a template for consistency. It applies formatting to your text. A good template determines all the headings, subtitles, font styles and sizes, and consistent colors. Don’t sabotage a perfectly good newsletter with a boring subject line. Your subject line needs to stand out if you want your readers to open it. If you want your readers to click through to a landing page, make sure that landing page is also mobile-friendly. Be thinking about the entire mobile experience, which includes directing subscribers out of the newsletter and onto your website. Don’t skimp on your investment in email newsletter design. When you send out mobile device friendly email newsletters, you are much more likely to retain subscribers and give them the experience they’re looking for (assuming they love your content). Your readers not only appreciate this effort, they expect it. ← Video – What’s Missing in Your Marketing?